A rustic grapevine trellis. Painting by Jean Kieffer. By now, we’ve all heard Bill Withers’ classic swooning lyric “we all need somebody to lean on.” As I was working on building a trellis for the tomatoes in my home garden last weekend, I couldn’t help but think of this lyric’s many meanings – it’s a simple adage and it’s so true! As a new POP intern, it is exciting to think of all of the partner and community support POP depends upon to grow: without you all, POP would be unable to thrive. In the same way, I love to celebrate all of the support we give our orchards to do the same. What does our orchard support look like? 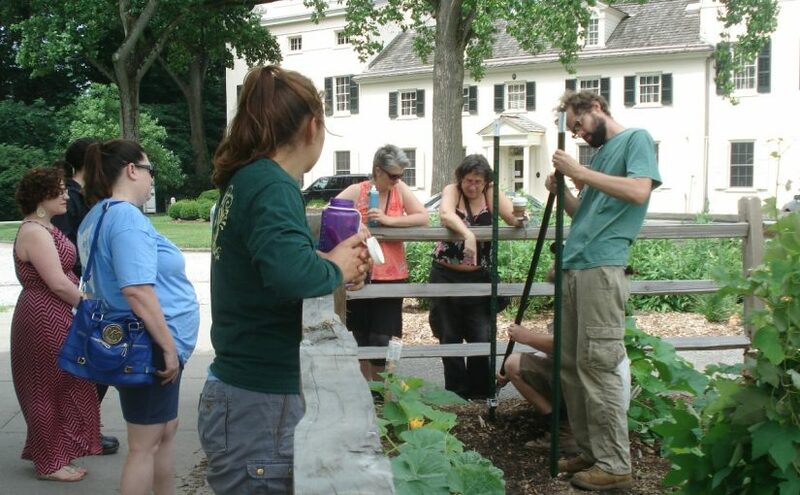 Many things: from pruning training and pest and disease management advice to harvesting and trellising. As I pounded the stakes of my tomato trellis into the ground, I was struck by the romantic notion of the trellis as something for our orchards to lean on. So, how do we lend that support? 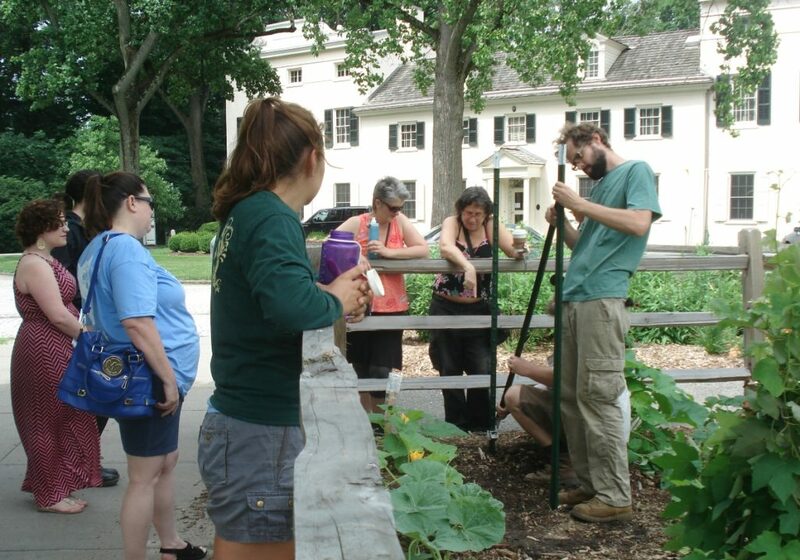 Training grape vines to a new wires at POP’s trellis-building workshop at Historic Strawberry Mansion in 2015. 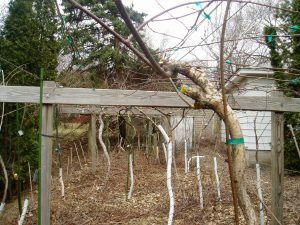 There are two main types of plants that POP orchardists work to trellis: brambles like raspberries and blackberries and fruiting vines like grapes and hardy kiwiberries. Trellising these plants helps ensure efficient fruit production, easy harvesting, space management, and airflow to reduce mold and disease formation. 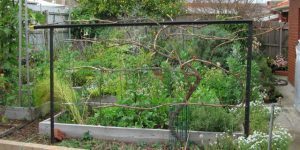 In this post, I am focusing on trellises with posts perpendicular to the ground and wires running horizontally in between posts. Trellises are best constructed with strong materials to support the weight of the plants. These materials can include wood, metal, or bamboo posts and galvanized wire. Various hardware can also be used including turnbuckles, wire strainers, hooks or nails for training, and eye bolts. For extra support, use cement at the base of the posts, utilize anchor posts and wires, angle posts away from the inside trellis, or construct the trellis on a pre-existing structure. Tighten cross wires to avoid sagging by using a turnbuckle, strainer, or other wire tensioner. Utilize appropriate spacing based on the weight and growth patterns of your plant. For example, most grape vines are planted with about 7 or 8 feet of space in between each plant, whereas kiwis are planted 10 to 12 feet apart. 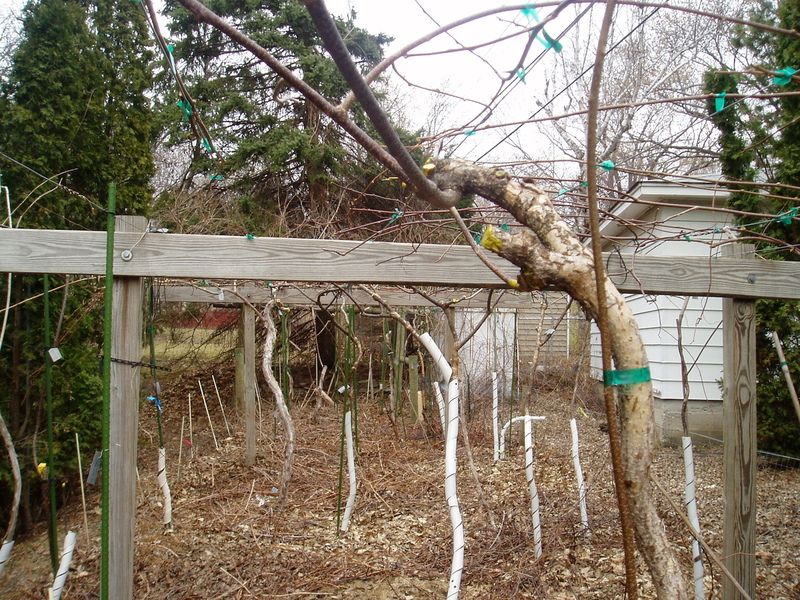 Maximum distance between posts for a properly supported trellis is 20 to 30 feet, so you might fit 3 or 4 grapes but only 2 or 3 kiwis between each post. 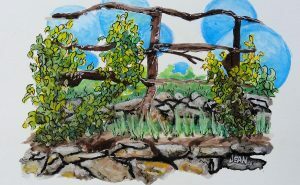 For heavy vine crops like grapes, kiwis, and trailing blackberries, additional support is needed at either end of the trellis to keep the weight from pulling the structure inward. Options include h-braces, posts angled outwards, or ground wires. These are generally not needed for raspberries and upright blackberries, whose stems can support some of their own weight. 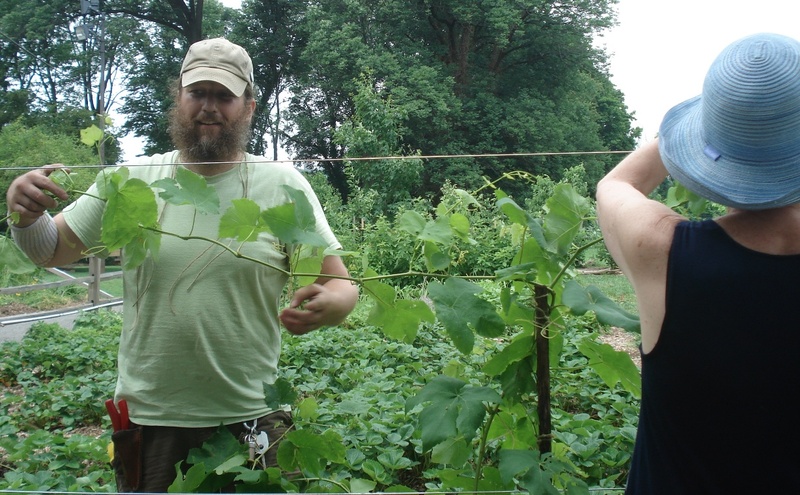 Twist ties or horticultural ties are useful for training the vines to the trellis. Just be careful not to tie them too tight and choke of plant growth. Be creative and thrifty! There are many ways to recycle materials to construct strong trellises. Constructing angled t-post end supports for a new grape trellis. This edition of POP Tips prepared by POP 2017 intern Amy Jean Jacobs.